Mostly I write about the biology and evolution of life in the sea, mostly. I've said in the past that the lion's share of the really amazing fossils, in terms of preservation and importance, seem to be coming out of China in the last 10 years or so. But, now an exceptionally well preserved theropod dinosaur has been unearthed in Germany. And it's important too. It's a feathered theropod dinosaur that is only distantly related to the group of theropods that gave rise to the birds. 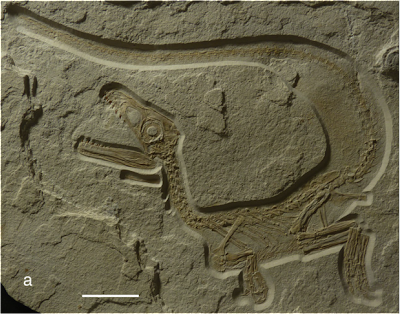 A photograph of the new feathered dinosaur fossil, Sciurumimus albersdoerferi. The scale bar shows 5 cm, so, as it's name suggests, it's about the size of a squirrel (image taken from the paper). 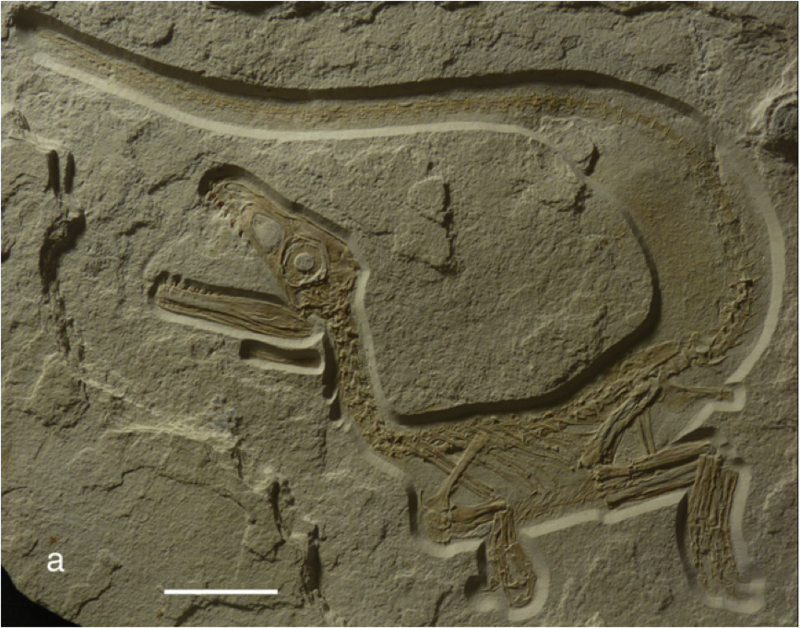 The researchers gave it the name Sciurumimus albersdoerferi. The genus name means squirrel mimic because the feathers on its tail make it bushy like a squirrel's. The species name is given in honour of Raimund Albersdörfer, who made the specimen available to the researchers for their study. The fossil is important for a couple of reasons. The first is that it is distantly related to other theropod dinosaurs that we know for sure had feathers. Which pushes the evolution of feathers back closer to the common ancestor of all theropods. Combine this with the evidence that some heterodontosaurs had feathers and the hypothesis that the common ancestor of all dinosaurs was feathered gains some weight. But, the independent evolution of feathers in the theropods and heterodontosaurs is far from refuted. 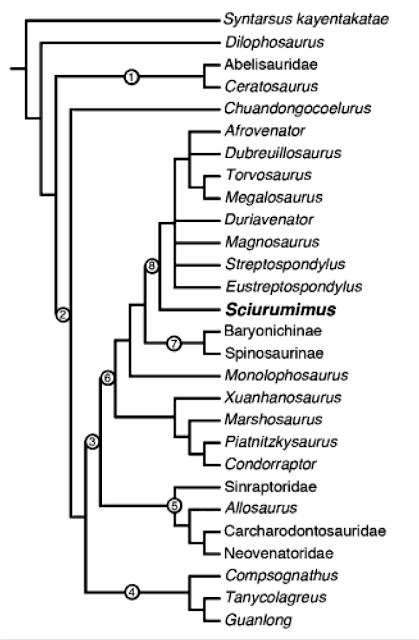 A phylogenetic tree of theropod dinosaurs. We know feathers are present in group 4 (at the bottom) and now group 8 (in the middle), which takes the evolution of feathers back to at least group 2. This group, known as the Tetanurae ("stiff tails"), includes most theropods (tree taken from the paper). The other reason this fossil is important is that it is the best preserved fossil megalosauroid thus far discovered. Indeed, it provides the only complete megalosauroid skeleton. Therefore it provides evidence that helps resolve several questions about the evolution of traits in theropods, such as the evolution of bones in the hand. An interesting side note is that this fossil is of a very young individual, which probably died soon after hatching. Therefore, the bushy tail is almost certainly not a sexually selected character. This pours some cold water on the hypothesis that feathers evolved in dinosaurs primarily as a means to signal mate quality, which was claimed in another recent paper. No offense meant, but the fossil pictured above doesn't look real. The lines of the cavity that reveals the specimen are extremely uniform, and there are no visible errors in uncovering the skeleton, even for the accessory bone (?) under the jaw. Is it perhaps a cast..? The bone below the jaw is the hyoid. Although it appears that the fossil is sitting in a depression, it's actually raised above the slab surface. The photo is lit from the bottom left, not the top right. This is clearer if you focus on the area around the hand and foot. The specimen was found during systematic excavations in the Rygol Quarry at Painten, Bavaria, Germany. First, the bony elements of the central area of the body appeared after cleaning on the floor of the excavation area, so the slab with the skeleton was excavated and brought into the laboratory for preparation. In the laboratory, the upper surface (the surface exposed in the quarry) was stabilized with ceramic glue (Knauf Uniflott) and was fixed to another slab. Then, the specimen was prepared mechanically from the underside. Damaged areas were reconstructed with Mapei Keraquick, which is clearly visible under UV light. Loose bones and sections were glued onto the specimen, but no arrangement or orientation of bones was changed. The specimen was studied by H.T. before preparation, so there can be no doubt about its authenticity.